To understand how a transmission works we need to explain why you need one in the first place: torque. As you know, torque is what makes the car move. The car's weight, inclination of the road surface and engine characteristics all combine to dictate the amount of torque necessary to smoothly drive along. Engines themselves aren't constant-torque devices. The physics of internal combustion engines limits the rev range over which they produce the maximum torque, until recently (due to fuel injection and computers) rather high up in the rev range. Since we can't run our engines at constant speeds we need to attach them to something that will mechanically multiply torque to allow the smoothest possible operation. That's what transmissions do. They effectively "smooth out" the torque curve of the engine to allow the car to start off, accelerate at a desired level and then to cruise on level ground at the highest speed with the engine running at its most efficient range. Lots of things go on inside your transmission, so let's take a look at the basics and build up from there. If you've ever seen one outside the car you have noticed that a shaft extends out the front of the gearbox and another (usually splined) extends out the rear. While it appears that there is only one shaft extending from front to back, these are actually two unattached drive shafts. 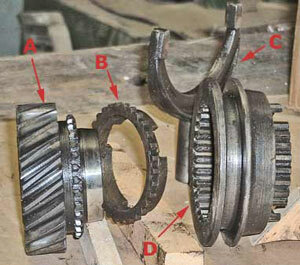 A shows input shaft; B the output shaft, C the Layshaft (cluster gear), and D shows the reverse gear. The forward one is called the Input shaft. It is mounted in a large, heavy-duty bearing at the front of the gearbox. Its front end is splined to mate with the clutch disc and its rear (inside) end terminates in a gear that is hollowed out in the center. This gear is mated to a drive gear at the end of the Layshaft. The Layshaft (also called the "cluster gear") is a single, forged unit that has ground on it the number of gears the transmission has (3-speed, 4-speed, etc.) plus, sometimes, a drive gear for reverse. It is hollow down its center. A central shaft runs through the layshaft and is mounted in needle bearings. Power is transmitted from the input shaft, through the layshaft and directed through each specific mating gear — controlled by the shifter — to the output shaft. From there it is mated to a drive shaft to propel the car. 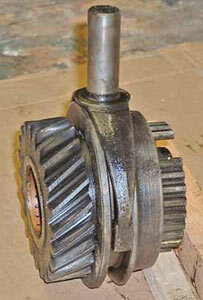 The Output shaft sits inside the transmission and is held in place by a large bearing at the back end of the gearbox. At the front end it is set in needle bearings that ride inside the hollowed-out input shaft gear. The tolerances in this arrangement limit fore-and-aft and side-to-side movement, so it is correct to say that the output shaft is "fixed" in place. A shows gear (1st gear), B is the synchronizer, C the shift fork, D shows the shift hub. On the shaft are mounted all the gears (there is no limit to the number of gears a transmission can have, but common practice limits them to 6 forward speeds. Generally, 5 and 6 speed transmissions incorporate an overdrive gear in the highest shift settings) and the shift hubs. Each of these gears mates perfectly with its counterpart on the layshaft, directly below it, and each gear is cut with the number of teeth to produce a desired ratio, which in turn creates torque multiplication by altering the relative speeds of the engine and output shaft. For instance, if first gear has a ratio of 2.58:1, the input shaft will turn 2.58 times for every one revolution of the output shaft. Allowing the engine to rev higher with respect to the output shaft creates more available torque to move the car. The gears in a transmission, except reverse, don't move. That is, they don't slide into and out of mesh when you shift. All gears are in constant mesh (alignment) with their counterparts on the layshaft at all times. In fact, the gears themselves aren't simple discs with teeth cut into them. They are thicker forgings that have an additional set of teeth cut next to the drive teeth. These teeth look like a close-spaced sprocket, and match in number and size the teeth on the synchronizer and shift hub (both to follow). Next to the teeth the gear tapers down to a cone-shaped face that matches the inner diameter of the synchronizer. The Synchronizer is a tapered bronze ring that sits next to the gear. The teeth on its circumference match those on the gear and, in turn, the splined cuts in the shift hub. When a gear is selected the shift hub slides toward it, forcing the synchronizer ring against the tapered end of the gear. The friction thus created tends to slow the speed of the assembly enough for the shift hub's spline to grab both the synchronizer's and gear's sprocket teeth. The Shift hubs do all the work. Once it is moved over a selected gear's sprocket teeth the shift hub locks itself to the gear. Since the hub is directly connected by a spline to the output shaft, the gear/hub combination is now driving the output shaft. The layshaft (remember?) drives the gear's mating gear, transferring engine power to the output shaft's gear and their relative number of teeth dictate the overall ratio of engine rpm to output shaft rpm. In other words, the transmission is now in a selected gear. Inside the hub are spring-loaded detents that allow positive actuation and feedback to the driver. For economy of space and weight, each shift hub is designed to move in two directions. Therefore, in a four-speed transmission there are two shift hubs, one for first-second and the other for third-fourth. In five-speed transmissions manufacturers frequently couple 5th and reverse into the same hub. The Shifter is a relatively simple device that allows the driver to select gears. There are countless mechanical arrangements that transfer motion of the driver to move the shift hubs, but inside the transmission the same thing happens in all cases. The shifter moves a fork that rides in the hub. The fork then pushes the hub in either direction, selecting the appropriate gear. All the parts above are assembled with extreme precision and ride in hundreds of needle bearings. The whole assembly sits in a pool of gear oil, the purpose of which is to ensure smooth, relatively frictionless operation. The oil helps keep the gears cool and traps microscopic metal particles that occur as the parts wear. Properly maintained, a transmission will easily last the life of the car. However, abuse or lack of routine service (checking the oil level at a minimum!) will frequently result in expensive failures. Synchronizer rings are especially vulnerable to dirty or "burned" oil. They are usually the first items to go, so if your transmission is hard to shift or grinds in a particular gear, be prepared to take it apart.